FAMILY SPECIALS: This symbol identifies advertisers offering specials (e.g. room rates, menus, etc.) for families with children under 18. Lovingly curated Edwardian, nestled between the Festival and downtown. Tranquil front porch and charming parlour. Scrummy served breakfasts. King, queens or twins, all ensuite. Central air. WiFi. Parking. Non-smoking, pet-free. TripAdvisor Certificates of Excellence. TripAdvisor award-winning property. Offering boutique-hotel amenities and old-world elegance. Walking distance to downtown. We are more than an accommodation; we are a destination. Beautiful heritage Victorian home. 15-30 minute walk to all theatres, shops and restaurants. Three exquisite, unique guest rooms on second floor, all with renovated ensuite or private bath. Central air, smoke-free, Wi-Fi, 24-hour coffee/tea, fresh-baked cookies, free parking, and sumptuous four-course gourmet breakfasts. TripAdvisor Award 2018. Enjoy the serenity and peace of historical Crown House. We are located downriver from the new Tom Patterson Theatre site. Est. 1998 – Inviting, peaceful, comfortable rooms, each with king or twin beds, ensuite bath, A/C and fridge; one ground-floor suite with private entrance & Jacuzzi bath. Three common rooms upstairs; a new fully equipped guest kitchen, a dining/relaxing room with TV and a quiet reading room. Enjoy a generous healthy breakfast on our outside deck overlooking the river – special dietary needs met. Ample on-site parking. WiFi. Two persons $185.00 incl. taxes. Cash, Visa & MC. SABBA. Welcome home! Just steps away, from the Festival theatre & minutes to downtown. Our 4 well-appointed guest rooms are able to meet a variety of needs and our full breakfast, is always, a leisurely experience. Ample parking A/C throughout, free Wifi, SABBA approved and TripAdvisor recommended. Discover this beautiful open-concept home & colourful garden oasis; hammock, gazebo, picnic areas & waterfalls. Spacious unique rooms, ensuites, A/C, WiFi, TV, fridge, shower seats. Lively hosts, 30 yrs. experience. Delicious healthy breakfasts. PRIME LOCATION! Park & walk to theaters + downtown, 3 elegant rooms in boutique restored heritage home. Enjoy our garden and patio/porches . Bistro designer breakfast. AC WiFi TV. Twin, queen or king with sumptuous amenities. 1872 mansion, park-like setting 10-minute walk downtown. We have a large guest lounge, central-air, wireless Internet and pool. All bedrooms have ensuite baths. Enjoy a full-service breakfast. Non-smoking. Ideal Location! Close to theatres/downtown. Warm hospitality, great breakfasts, guest living room, WiFi, river view, A/C, parking, room TVs. Smoke/pet-free. Rooms 1&2: king/twin beds/ensuite baths. Room 3: king bed/private bath. Room 4: main floor, twin beds/private bath. SABBA, City licensed. An elegant 1870 Italianate home ideally located one block from Stratford's charming downtown. Our smoke-free home offers twin/king beds, air-conditioned ensuite rooms. Enjoy a delicious breakfast in our guest dining room and relax in the living room or on the large front verandah. Our 18th season. Great location for walking to theatres. Three rooms (first-floor queen, second-floor queen and second-floor king/twin); each has ensuite bath, fridge, TV. Full breakfast, central A/C, ceiling fans, enclosed sun porch, parking, smoke-free. City licensed.SABBA. Unique downtown literary B&B in 1857 home. Photo-gallery of writers, books, piano, art and antiques. Full breakfast, large verandah and parking. Central air. Shared baths. Twins, doubles, large family room. Hosts: published writers and poet. Reiki and Tarot available. 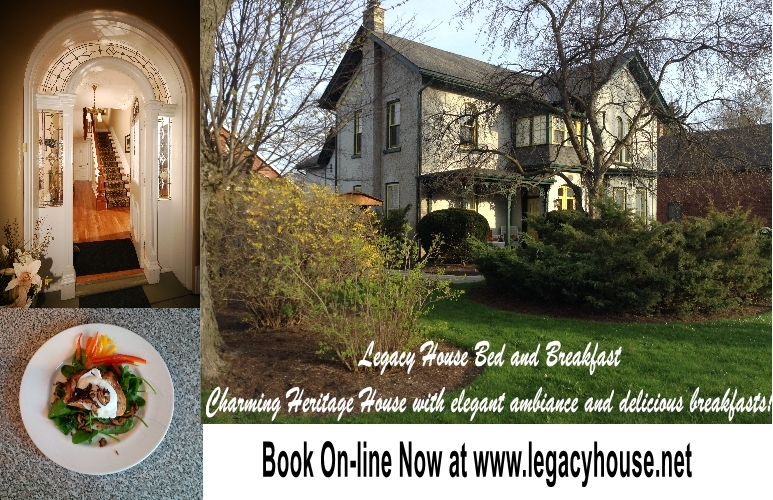 Enjoy warm hospitality in a classically appointed century home. Quick walk to theatres & downtown. Four rooms – 1 king & 3 queen beds – all with ensuite bathrooms. WiFi / TV / kitchenette / lounge areas, perfect for larger groups & longer stays. See website for specials and availability. Smoke & pet free, A/C. SABBA. Stratford’s secret destination. Twenty gorgeous rooms nestled at picturesque McCarthy Lake only two minutes from Stratford. Hide yourselves in 32 acres of forest, wetlands and lake-front. Boats, bikes, BBQs, trails, campfires, and breakfast by the lake, saltwater hot tubs, and peace and tranquility. Cancellation policy. No smoking, no pets. OAA, SHMA, STA. Historically designated 1881 Italianate home. Park and walk everywhere. Three gracious bed-sitting rooms with large ensuite bath, Cable, A/C, WiFi, hot breakfasts, special diets accommodated. 1 dog "Stella". Apr/May specials. Charming 1873 heritage house with unique elegant ambiance. Easy walking distance to theatres, shopping and restaurants. Gourmet breakfasts, complimentary beverages and homemade cookies included. Comfortable areas for guests to relax with laptop, music and TV. Italianate porch, swing and patio to enjoy our garden. Central A/C, free WiFi and parking. The adventure begins here and a warm welcome awaits in our century home 2 blocks from the Avon River. King, twin or queen bed rooms all with ensuites, guest lounge with cable TV and WiFi. Fridge, microwave, coffee maker available in the dining room. Full hot breakfast featuring fresh baking. Gluten free options and accommodation to other dietary needs - just let me know! "Queen & Albert is the best-kept secret in town"– top rated on TripAdvisor. An artful B&B experience up the street from the Festival Theatre. Fresh, welcoming suites with terraces, ensuite baths, TV, WiFi, A/C, fridges. Boutique-inn elegance, fine breakfasts. Luxury Victorian mansion. Spacious & elegant rooms with modern amenities. Exquisitely prepared breakfast, fresh baking, vegan and G.F. options. Enjoy our parlour, wrap-around verandah and gardens. Wi-Fi, A/C, ample parking, smoke/pet free.TripAdvisor 2018 Hall of Fame and Travellers’ Choice Awards. Gracious lodgings in an 1870s Italianate main house, two Edwardian townhouses and a romantic carriage house: ensuite baths, A/C, balconies, art, antiques, heated saltwater pool, town centre. Delightful breakfasts, caring host. Nestled in a private, quiet, country setting a 5-8 minute drive to all theatres and downtown. Captivating gardens, a sparkling outdoor pool and Victorian gazebo. 24 tastefully appointed non-smoking rooms with A/C, fridge, free WiFi. No pets.TripAdvisor Hall of Fame. 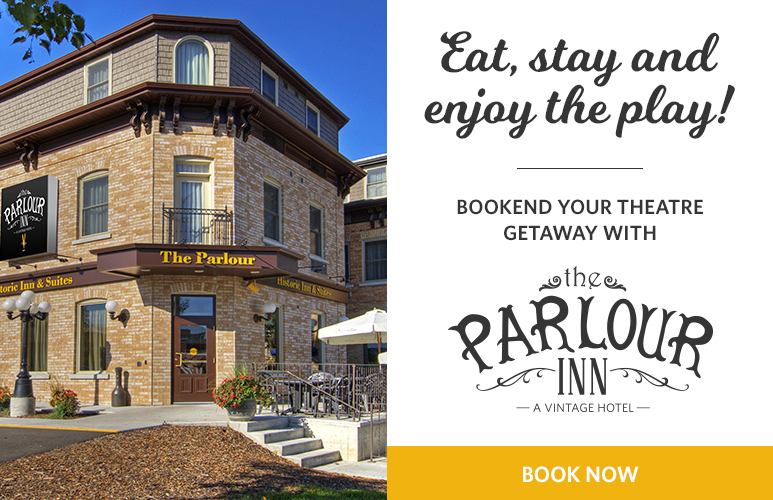 Built in 1871, The Parlour Inn is located one block from the Stratford Festival theatres. 28 warm and contemporary guestrooms and the 240-seat dining room create a historic oasis in beautiful downtown Stratford. Built in 1875, the hotel features 12 charming rooms & suites. Located in downtown Stratford. Walking distance to all 4 theatres, restaurants and shops. Free onsite parking, WiFi, and much more! Virtual tours available on our website. Charming, affordable and comfortable rooms located within walking distance to theatres, restaurants and shops. Non-smoking rooms offer refrigerators, AC, cable TV, phones and free WiFi. Relax in a quiet, park-like setting in our private yard. No pets. Elegance, tranquility and warm hospitality create a special ambience in Stratford’s first motel. Park-like, private court with landscaped lawns, 20 comfortable smoke-free rooms, all with refrigerators, microwaves, phones, cable TV, air conditioners and wireless Internet. Suite, kitchenettes available. Complimentary light breakfast. Five-minute drive to theatres. No pets. Cancellation policy. OAA. Discover the charm. Offers 32 unique, beautifully appointed guest rooms and suites. Located in downtown Stratford within minutes of all four theatres, shops and recreation. A 160-year tradition of warm hospitality, unequalled service and excellent dining. Home of the Boar's Head Pub. Free parking. Groups welcome. Free WiFi. STA, SHMA. In the heart of Stratford’s uptown, our nine rooms offer unique, exotic furnishings in a soothing environment. This turn-of-the-century building boasts private baths, patio, steakhouse and elevator, all in a prime location. Personal service and excellent breakfast are our specialties! STA, SHMA. Thirty-one tastefully well-appointed non-smoking rooms with fridge, flatscreen TV/DVD, hair dryers, A/C and free WiFi. Enjoy quiet atmosphere, outdoor pool and gazebo in private country setting with spacious grounds. No pets. SHMA. Retired/closed. Lynn and I would like to thank our many guests and the Stratford Festival for 15 wonderful years and many happy memories. We wish the Festival much success with their 2019 season. Welcoming guests for over 50 years. Located at the eastern edge of the city offering a quiet picturesque setting. Spacious guest rooms, exercise centre, indoor pool, sauna & whirlpool. Complimentary breakfast offered each morning. Located in a beautiful country setting just minutes from all the city offers. Our stylish well-appointed rooms have all the amenities expected from today's traveller. Wheat and corn fields provide a scenic backdrop for our mature grounds, heated pool, and gazebo. TripAdvisor top rating. Offering large newly renovated guest rooms & suites. Indoor pool, hot tub & fitness centre. Enjoy a fresh new dining experience with daily features & Sunday brunch. Free ample parking. Located just minutes from the Festival Theatre, downtown core & Stratford’s east end. Twenty-four rooms with A/C, fridge, TV and phone. Walking distance to theatres, restaurants, shopping mall, golf and country club. Complimentary morning coffee and muffins. Special rates for groups and seniors. No pets. OAA. Experience exceptional service in a luxurious setting just steps from the Festival Theatre. A full-service hotel featuring 25 beautiful, wheelchair-accessible rooms, indoor pool and elegant dining in The Restaurant and The Lounge. Our charming 25-room inn offers spacious guest rooms, free WiFi, parking, cont. breakfast & onsite restaurant. In quaint St. Marys, the historic Stonetown just 15 min. from Stratford. You’ll enjoy our small-town hospitality! Convenient downtown location, one block from Avon Theatre. Comfortable architect-designed flats featuring interior brick walls, hardwood floors, kitchens, original art, central air, Wi-Fi, and cable TV. One-bedroom, one-bath suite great for two. Two-bedroom, two-bath ensuite apartment with sunroom and private roof-top deck, ideal for families or two couples. Smoke-free. Feel at home in one of our 10 upscale extended-stay beautifully furnished apartment suites all within the Stratford downtown. Some feature full kitchens, laundry, outside decks or patios and parking. Free WiFi. Available nightly, weekly or monthly. Lavishly furnished apartment units, two locations, all amenities, self-serve breakfast, walk to theatres and downtown, on-site parking, very private. Your home in Stratford is open all year round. Two restored three bedroom Heritage homes. Self-Catering. Each house accommodates up to six persons. Central location. Ensuites; kings or twins. Sitting and dining rooms, fully equipped kitchens, sun porches, gardens. Parking. Central air. Wi-Fi, TVs. Photos on website. Ideal for short or long stays; independent travellers will enjoy our private one- and two-bedroom air-conditioned suites. Easy walking distance to theatres and downtown. No smoking. $125 to $290. Idyllic riverside cottage with lovely sunroom, large terrace, and fully-equipped kitchen. Accommodates up to 8 people. Verdant backyard extends to river and front overlooks the scenic Westover Estate. 15 minutes to Stratford. Charming English-style cottage and carriage house backing onto the Thames River; only a five-minute walk to downtown St. Marys or a 20-minute drive to Stratford. Features lovely garden, private deck, deluxe whirlpool bath, fireplace, fully-equipped kitchen, living room with desk and pullout sofa. Separate bedroom with queen bed. Minimum two night stay. Year-round. Reservations through Queen's Inn. Beautiful treed campsites, swimming pool, hiking, fishing, boating, mountain biking, sand beach and recreation programmes. We offer a relaxing camping experience that is only 11 kilometres west of Stratford on Hwy. #7. STA.